Car crashes, head injuries, amputations, heart attacks, drug overdoses, broken legs, snake bites, explosions, burns, poisoning, drowning.....would you know what to do? 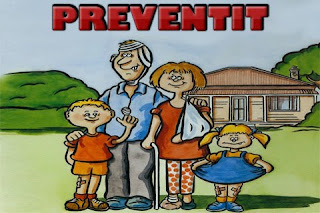 PreventIt is the creation of a Brisbane nurse Bianca Raine and aims to assist people (especially school-aged children) in learning first aid principles. It began as a boardgame, but has recently been revamped, so that it is now available on PC, Mac and the Apple iPhone/touch. The application provides a plethora of information, ranging from managing broken legs to treating burns. In addition, to challenge the participant there are over 1500 multiple choice questions, covering 9 different categories. My initial impression from the screenshots is that the design could be a bit more polished. Unfortunately I was unwilling to cashout $5 for the application, so I can't comment on the application's actual performance and functionality. Overall however, I applaud the idea of developing an application to inform students of first aid principles in a fun and interactive way. I have heard great reviews about the original board game, so I encourage health-conscious parents to give this a try, and see if your kids can learn some life-saving skills. Checkout the homepage of PreventIt or the Itunes App Preview. More information about First Aid principles and Basic Life Support.